Donald Trump recent anti-Iran barking at the United Nations General Assembly which Iranian president Hassan Rouhani called absurd and hateful. “They go low, we go high. I’m not Donald Trump and do not expect me to operate his level,” said Rouhani. Trump called Islamic Republic “an economically depleted rogue state” and described the current multilateral nuclear agreement with Tehran (JCPOA) as an embarrassment to the United States. The remarks were cheered by Israeli prime minister Benjamin Netanyahu and American Jewish Lobby. However, the UK, France, Germany, Russia and China have warned Washington that if it walked out off JCPOA, none of those countries will follow its lead. 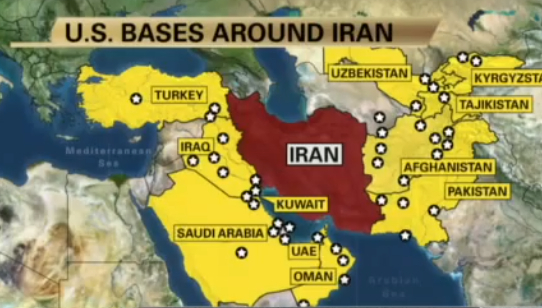 In-spite of all the Neoconservative pundits (majority being Zionist Jews) scaremongering, it’s the US which threatens the security of Iran and not the other way around (study the map on right). In a recent article published at the Jew website Lobelog, Iranian-born American professor Shireen T. Hunter (Georgetown University) advised Iranian government to think about survival of their country from Washington’s threats by abandoning its support for the Palestinian resistance groups. “Trump’s approach towards Iran has been unwise, imprudent, and counterproductive, beginning with his frequent hints that Iran has not abided by the terms of the Joint Comprehensive Plan of Action (JCPOA). The Trump administration has also made continual threats to withdraw from the JCPOA, has imposed new sanctions on Iran, and has even hinted at possible military action against the country,” she said. “A military confrontation with the US could set in motion dynamics that could threaten Iran’s territorial integrity and its survival within its current borders. The experience of Iraq, Libya, Afghanistan, and even Syria serve as warning to the Iranian leadership about what could happen to their own country,” She warned specifically Iran’s Supreme Leader Ayatullah Ali Khamenei, the architect of Iran’s policy toward Israel. “The Iranian leadership must prioritize Iran’s survival over any other ideological goals, such as liberating Palestine and Jerusalem or fighting international imperialism. In other words, they must act as the leaders of a nation, not a universalist revolution or a crusade for a cause. Most, if not all, of Iran’s problems have resulted from this ideological aspect of its behavior and the lack of sufficient commitment to Iran’s national interests. They have persisted in this behavior even though they have paid a heavy price for it. Ironically, this ideological behavior has been limited to the Palestinian issue and Israel. In other regions, from Afghanistan to the Caucasus, Iran has essentially followed a non-ideological approach,” She asserted. Make no mistake, Ms Turner has very good credentials to back-up her statement. She is senior pundit at Zionist think tanks such as CFR, CSIS, Brookings Institute and Carnegie Corporation. Her husband Robert E. Hunter is former US ambassador at NATO and held key positions at RAND, CFR and IISS.